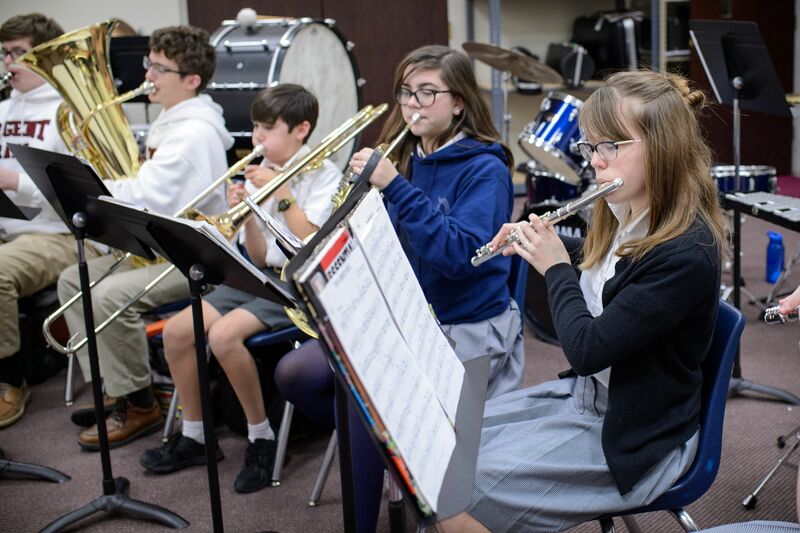 The Fine Arts Department at Regent Preparatory School seeks to equip students to use their God-given talents in art, music, and drama in order to bring beauty to the world, for His glory. To that end, the school employs classical teaching and methodology to ensure students are prepared in the theory, history, and performance of their chosen art form. In the grammar stage (PreK-6) students are introduced to the master artists, beautiful hymns, historical music, and the beginning theory of art, music, and theatre. As students move into the Logic and Rhetoric stages, they cultivate their artistic abilities and learn how to produce a polished “finished product,” whether that is a performance or a piece of physical art. The school equips students to pursue the gifts God has given them and to develop their talents in the event they wish to further pursue those at the university level. A significant percentage of Regent graduates have chosen to do so. At the Grammar School level, students are introduced to great artists and learn art skills by imitating their works. The school philosophy strongly supports that emulating the masters teaches students about what constitutes beautiful art. It also provides excellent content as they learn the elements of art and increase their own artistic skills. The students are introduced to the basics of drawing, painting, and sculpture through all kinds of creative projects. As students progress from one grade to another, their art is a reflection of what they are studying in history. A walk through the Student Gallery (i.e. the halls of the school) shows the amazing talent the students possess. Parents are occasionally asked to frame a piece of art for display in the gallery. At the Grammar School level students are introduced to great classical composers as well as great hymns of the church. Specific composers are studied in each grade and hymns are taught in the classroom and in music class each week. Students are also taught to read music both vocally, through the use of solfége, and instrumentally through the use of the musical alphabet. By the time students graduate to the Schools of Logic and Rhetoric they are proficient in reading music on the staff and are familiar with the entire major scale in the solfége system. This equips them to pursue further musical instruction in the school bands and/or choirs. The Regent Band starts in Class 5 and offers two years of beginning instruction preparing students to move into the elective offerings in Class 7. The experience of working together to produce something beautiful is often a new experience for the students and is an invaluable one. They learn that their individual effort directly contributes to the quality of the final product. Band meets two or three times per week and introduces students to the basic theory on their instruments. Students perform twice for the school each year during the two Fine Arts Weeks. They periodically visit retirement homes to share their music and go to a competition each year. Students also participate in honor band and Regent holds a solo and ensemble contest on the campus each year. 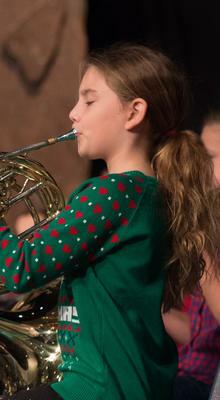 In addition to the normal concert band, students may also participate in Jazz Band. This band gives students the ability to learn jazz styles and improvisation. The Regent Choir experience begins in Class 7. Students are prepared for the experience of singing together, having learned 3-part and 4-part harmony in Classes 5 and 6. A wide variety of selections are chosen to give students a well-rounded experience. Choir students perform twice per year during Fine Arts Weeks as well as at various smaller performances for school events like Commencement and Grandparents’ Day. The choir travels to retirement homes and goes to a contest each year. Students participate in honor choirs and Regent also holds a solo and ensemble contest on the campus each year. Many of these students also lend their voices to the school musical each year. The drama program’s foundation can be seen throughout the Grammar School as students perform in class plays, readers theatres, and during special grade level days. The formal instruction begins in Class 7 with an elective class which gives them theatrical instruction and opportunities to perform in productions. The high school students participate in a play, a one-act performance, or in a school-wide musical. In recent years, musicals have included up to 80 or 90 students, across many grade levels. Many of our drama students eagerly participate in this production. Throughout the year, students are taught the mechanics of acting, the skills of set production, and technical requirements of sound and lighting. Regent offers Art I, Art II, and Photography I and II in the high school. 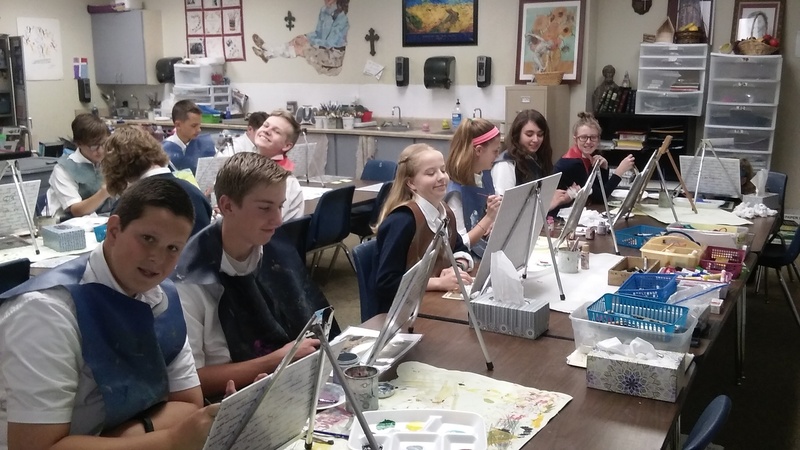 Class 7 and 8 students may also choose an art elective beyond the required art classes that enhance their history studies. Students expand on the knowledge they gained from grammar school art classes through various projects in drawing, painting, and photography. They participate in an art show during the December Fine Arts Week and an art contest during the Spring Fine Arts Week. A visiting artist comes each year to encourage students in their pursuit of the Visual and Graphic Arts.